Arslan’s army is victorious in taking the Keep, clearing the way to the capital. Silver Mask, wounded, has fled the battlefield and returns to Ecbatana to scheme with Guiscard. 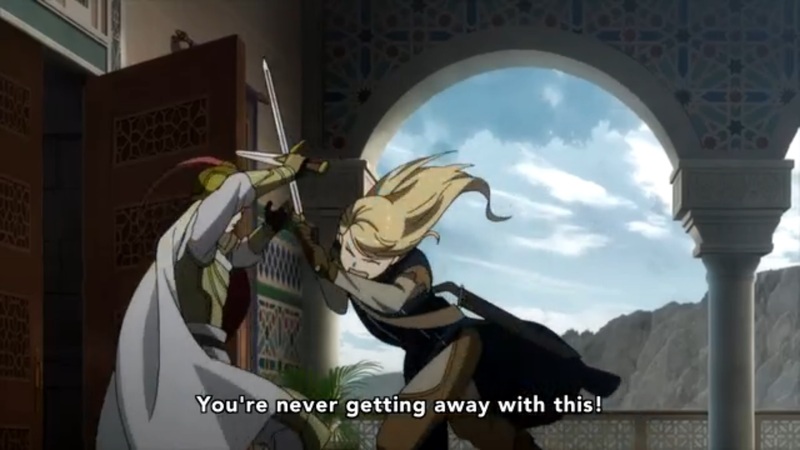 Arslan fights off Etoile, who is captured. 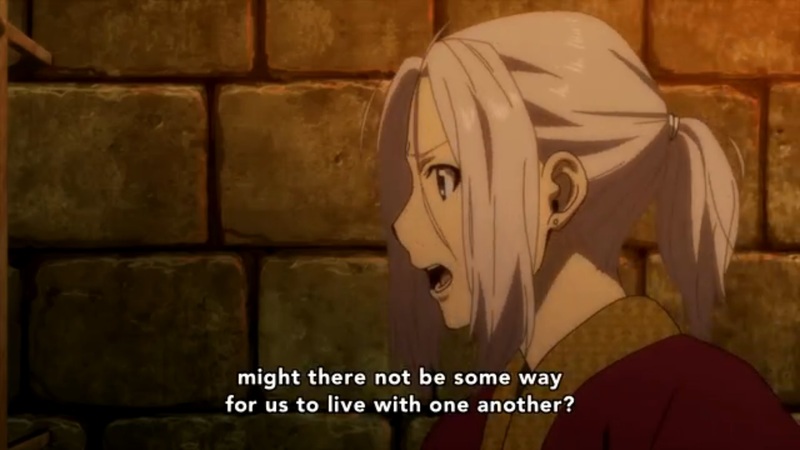 The majority of the episode is spent with Arslan attempting to bridge the ideological divide between himself and Etoile. The series comes to a close as the army begins its march to retake the capital of Pars. A lot of emotions rose up in me as I watched the final episode of The Heroic Legend of Arslan. Confusion. Disappointment. Anger. Certainly not the emotions the show was going for, but it was very effective at causing them nonetheless. Let’s go emotion by emotion as I unravel the tattered tapestry of failure that this final episode represents. For starters, there was plenty of confusion to go around, the kind that comes from not having enough time to tell a coherent story. Two episodes ago, Sam and Kishward were engaged in a battle of ideology and swords in the waterways under the keep. Things were looking bad for Kishward as Sam ambushed his small force and began to surround him. Last episode, with no explanation, Sam was suddenly above ground, defending against Pars’ cavalry charge before ordering a general retreat. I had assumed that Kishward had been killed, since we didn’t see any of him. 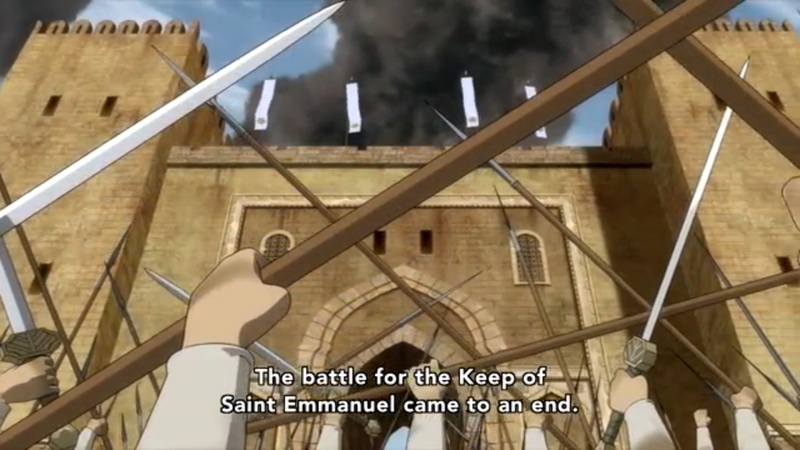 Now, in this episode, Sam is nowhere to be seen, and Kishward wanders up to Arslan and starts talking like nothing happened. Why was there no resolution to the underground battle, or to what happened to its participants? Until Alfreed found the Magical Victory Tunnel, this waterway invasion was the linchpin to the entire Parsian strategy, and we don’t even mention it? Alfreed falls out of some kind of grain chute that a Parsian soldier has operated. What? What?!? She was on top of the front gate! How did she even get close to wherever the grain chute is located? 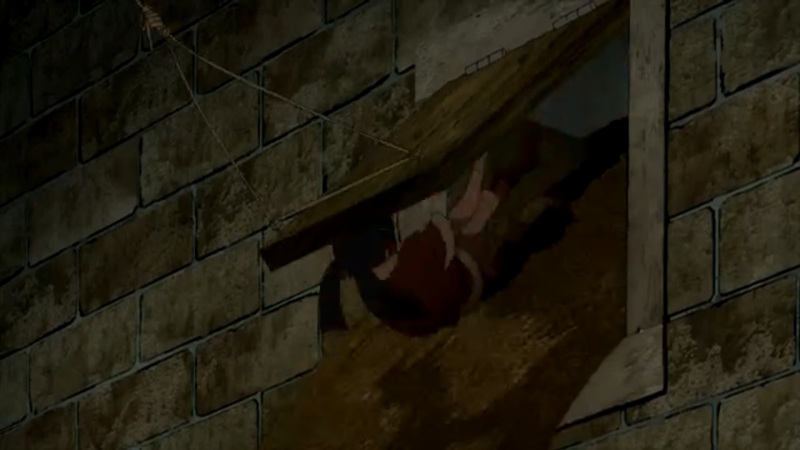 It’s a bad sign when even the characters can’t provide an explanation, and Alfreed’s confusion over how she ended up here is just left floating in the air. Whatever. Let’s move on to my disappointment. 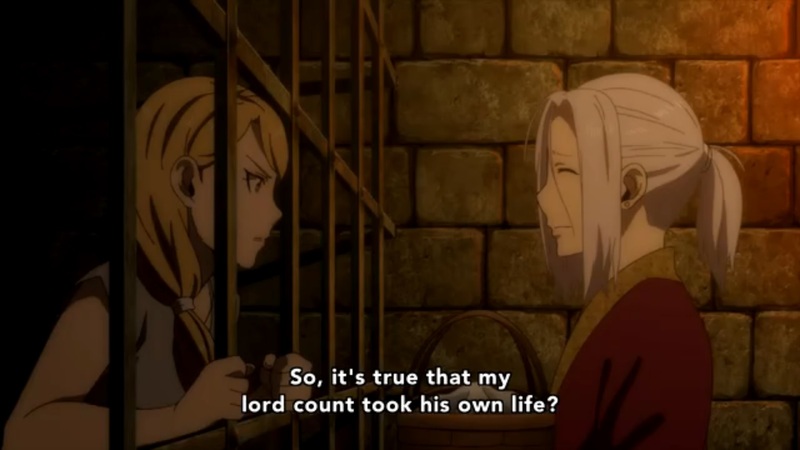 From the few glimmers of change in the previous episode, we’re back to Arslan playing a pretty passive role. His army finishes the battle without his help. Narsus is off planning all of the logistics needed to move the army. Daryun ponders Silver Mask’s larger plan. 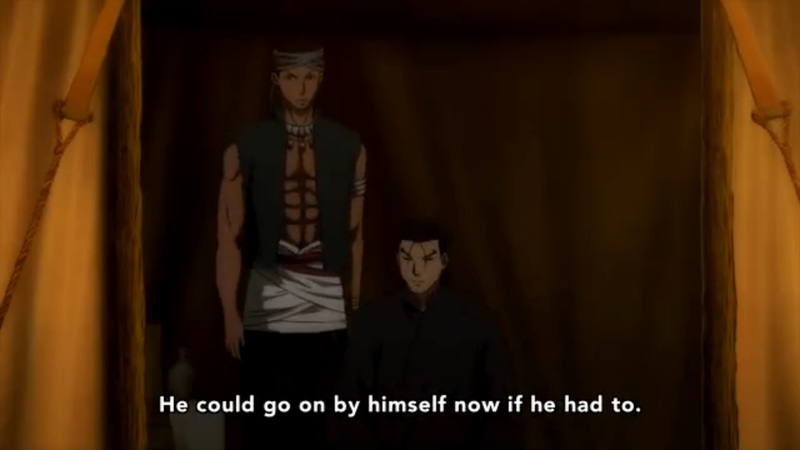 Gieve is shown briefly, off to retrieve something that will be proof of Arslan’s claim to the throne (this also serves as a very clumsy piece of bait for a second season). Daryun has a line that at least got a sad chuckle out of me. Oh, Daryun. No, he couldn’t. 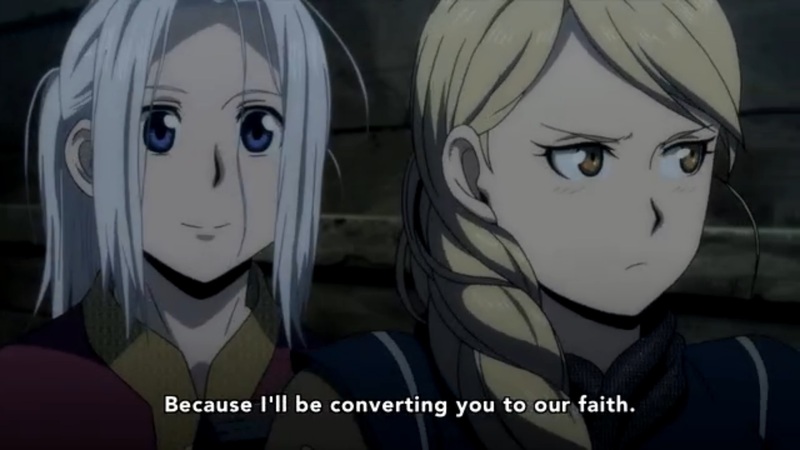 Arslan wouldn’t last half a day if he had to lead this army on his own, and it’s disappointing to think that he is little different from who he was at the beginning of the show. Lastly, anger. After his sorcerous retreat, Silver Mask returns to Ecbatana and meets with Guiscard. This is a pretty bold move for someone who just lost 100,000 soldiers, and who Guiscard already hates. As expected, Guiscard orders his men to seize Silver Mask. He promptly kills the men and has his sword at Guiscard’s neck. 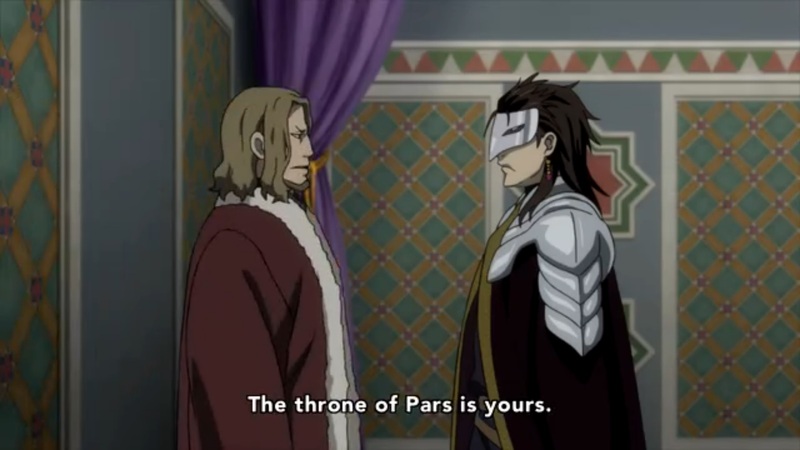 Finally, Silver Mask will kill Guiscard and seize power by organizing the panicked defenders watching Arslan’s advance. Except that isn’t what happens. Instead, he tells Guiscard that, with his men dead, they can talk without being overheard. He informs Guiscard of his lineage and makes a deal for Guiscard to replace his brother as leader of Lusitania while SIlver Mask takes the throne of Pars. Instead of agreeing wholeheartedly and then ordering Sliver Mask killed the moment he leaves the room, Guiscard goes for the deal. Huh. You’d never guess that both of these guys hate each other from the way they almost immediately come to an agreement. It’s angering because we’ve been building up the animosity between these two for nearly the whole show. Now, just after the significant weakening of Lusitania’s position by Silver Mask’s crushing defeat, they become all buddy-buddy? How will Guiscard explain why he’s still allowed to command troops? Or all the dead soldiers in the throne room? It’s just bad writing. There’s one character that unifies all of my feelings on this episode, and on whom the majority of the episode is spent: Etoile. 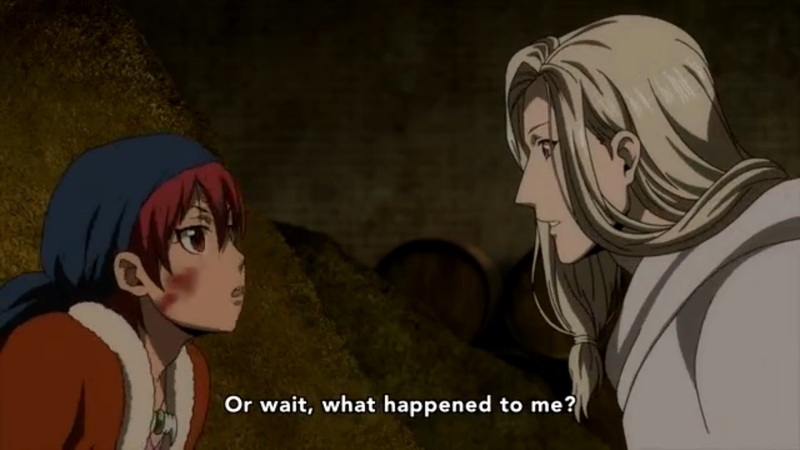 At the end of the previous episode, she burst in to Baracion’s chambers just in time to watch him fall to his death, apparently stabbed by Arslan. 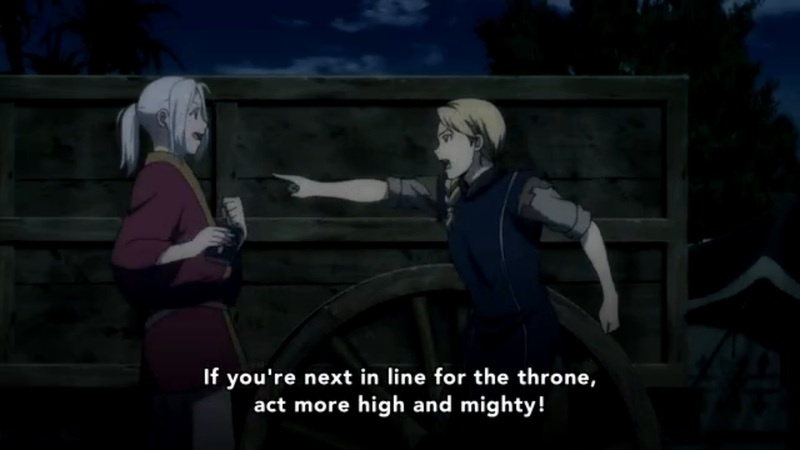 Indeed, the latter half of the previous episode was spent setting things up so this exact scene could happen, prompting Etoile to attack Arslan in a rage. 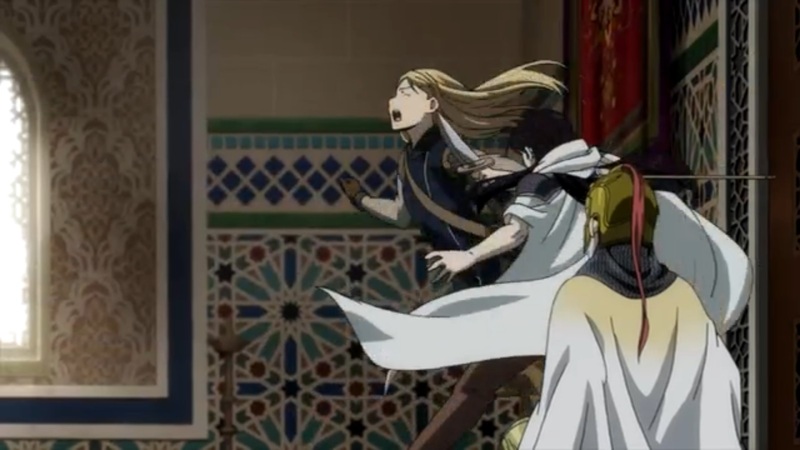 All right, I thought, it’s a little (or a lot) ham-handed, but at last we have an important fight for Arslan. It’s someone of about his skill level. They’re ideologically opposed, allowing them to trade words that represent what the two sides have been fighting for the entire show. The larger stakes of the battle have already been settled, but here we can settle things on a much more personal scale, which can be impactful if done right. The corner of my mouth turned up, just a little, as I settled in to watch this last important fight, which would surely take the majority of the episode. …Well. Now I’m just all scowls, all the time. Why did we even bother setting up this fight if it’s going to be finished almost immediately by Farangis? 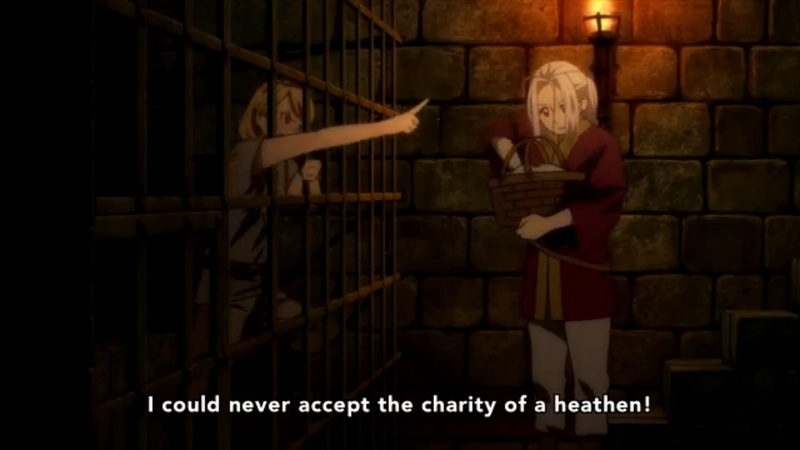 Etoile is quickly subdued and imprisoned, and Arslan wanders down with some food to talk with her. Way to deal with all that important army stuff, kid. 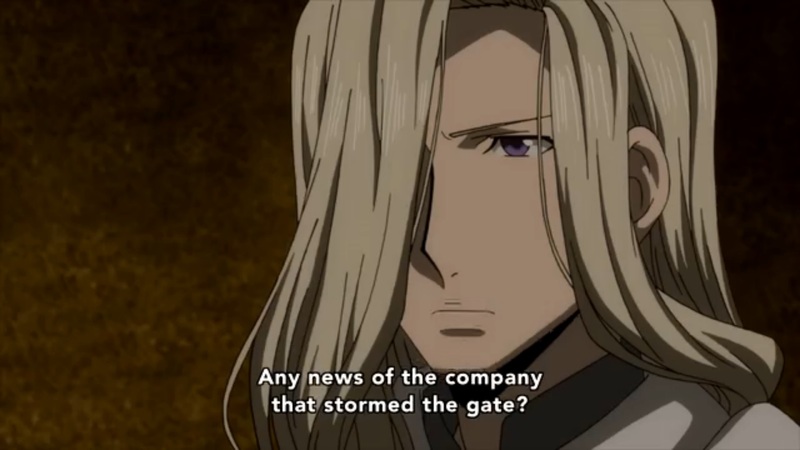 Immediately, the tension that we’d built over Baracion is defused, making me wonder, again, why they bothered setting it up so Etoile thought Arslan had killed him. 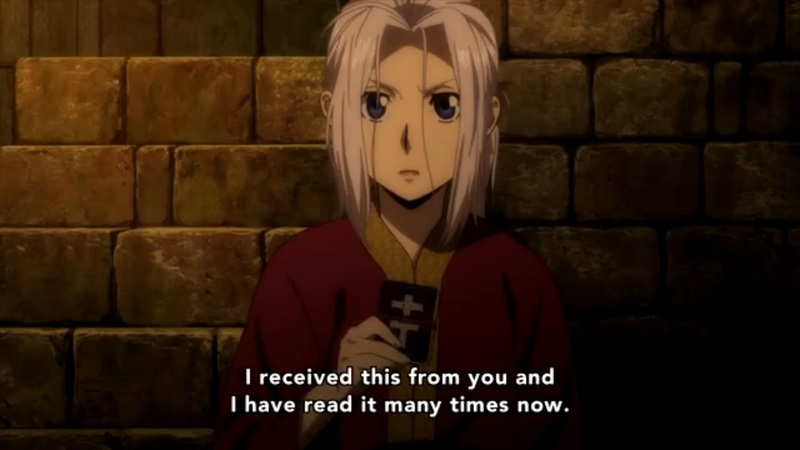 They get onto the topic of Yaldabaoth, as one does, and Arslan finally pulls out Chekov’s Bible. Finally! I’ve been waiting for this since he first got that book way back when. This is where he finally uses the teachings of the book to show both that he’s willing to try and understand Lusitania’s culture, and to show Etoile that her way of thinking about heathens is incorrect. Right? Of course not. Rather than quote some passages and explain his interpretation, or try to lead Etoile through some of the book’s teachings that support his point, he just says “I think your leaders are using this book incorrectly to make you attack us!” No support for his point. No reference to the text. He could have made his pacifist, everyone-play-nice speech with zero knowledge of that book. It is infuriating. Well, you took my dramatic battle from me, and you took my informed ideological confrontation from me, show. What’s left for you to ruin? You cut that out right now, show! 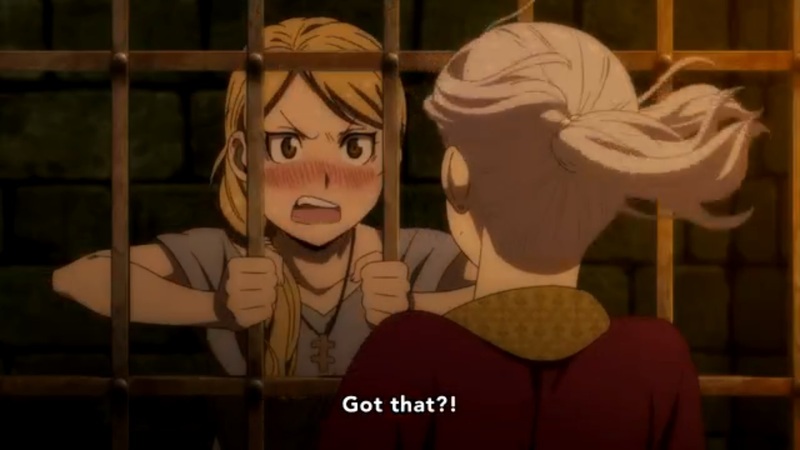 Don’t you DARE turn her tsundere for Arslan! Oh, screw you, show! 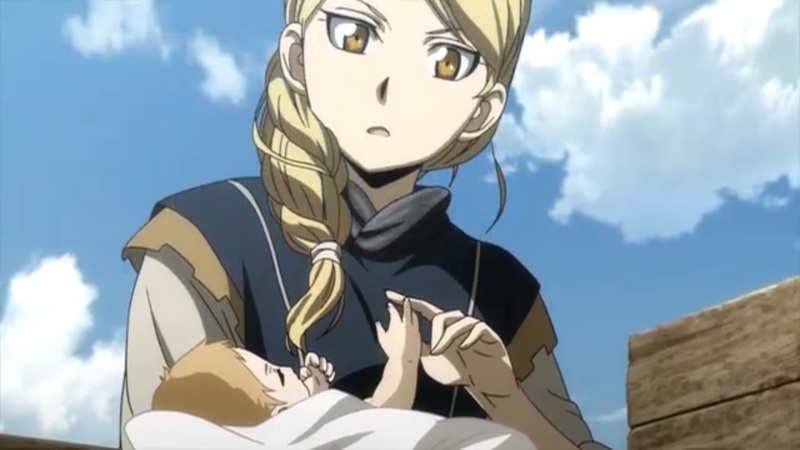 I can’t even tell what to be angrier about – That Etoile starts falling for Arslan on the same day her father figure was killed in front of her and tens of thousands of her countrymen died all around her, or that she starts acting more and more like a woman as soon as her hair is revealed. If it’s not her suddenly wide, ineffectual sword swings, it’s her high-pitched screeching when she yells, or some other reminder that she’s female. Babies. You must have babies. Get back into your assigned gender role! It’s all the more baffling because Farangis is, like, right over there, showing that a woman can be an effective warrior. Yet every time someone sees Etoile, they say something like “A woman soldier of Lusitania?”. Is it that surprising? Is it against their faith or something, and Etoile has been acting against the teachings of her own book? No explanation is given other than “What is that woman doing being a soldier?”. Oh, Etoile. You had such potential, and now here we are. To sum up, this episode was bad on its own merits, and worse for the various long-term plots that it brought to a confused, disastrous close. The confusion and anger have faded away, leaving only disappointment.